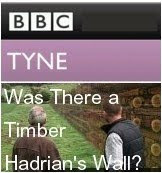 On Tyneside, between Hadrian’s Wall and the Ditch to the north, archaeologists have found three lines of double postholes, which, it is argued, represent an early Timber Wall, that along with the Ditch, formed part of a temporary frontier while Hadrian’s Wall was being built. Further, it is argued that the Turf Wall represents the continuation of this structure in the western sector of the Wall. In addition, when the engineering and layout of the Vallum is examined, it appears to be an unfinished road, probably abandoned when warfare interrupted work on the Wall. 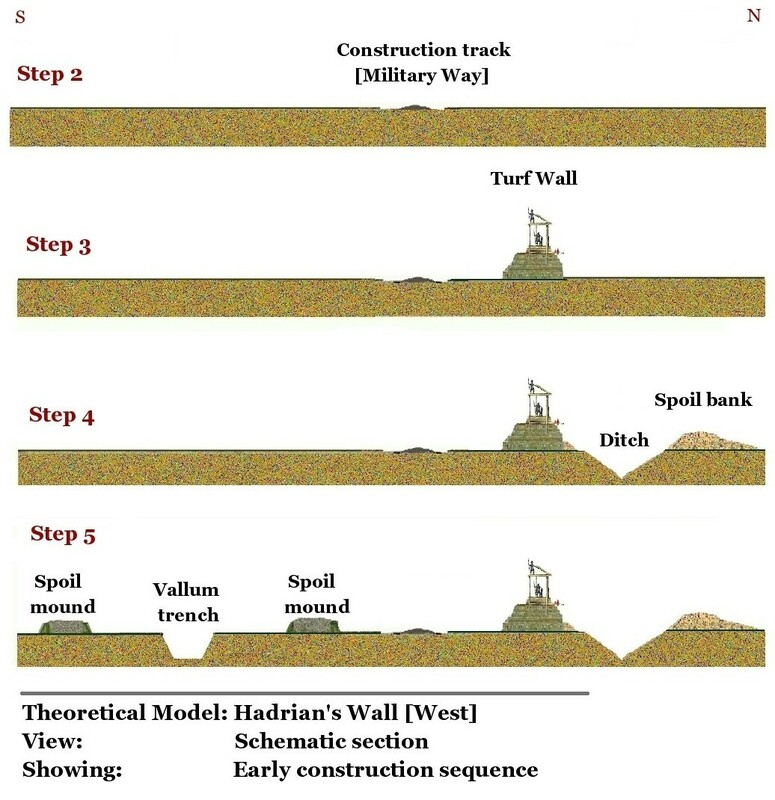 These insights into the archaeology of Roman military engineering are the key to a new understanding how and why Hadrian’s Wall was built. 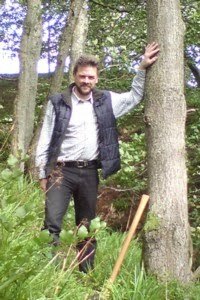 An updated summary of a series of articles from this site on the timber and earth structures predating Hadrian’s stone Wall. It is clear that, in accordance with normal logistical principles, the longest, more complex tasks, in particular those requiring the most skilled labour, were prioritised. In terms of the stonework, this was the milecastles. Thus, once construction of the Wall proper begins, things get quite complicated, with separate construction gangs working simultaneously on different aspects of the project. We also have to be aware that there are forts to build, and all manner of sundry logistical tasks, not to mention the day-to-day garrisoning and guarding of the frontier. However, it is possible to see logical steps in any major project of military engineering, and where the evidence is available, these are confirmed by the archaeology. 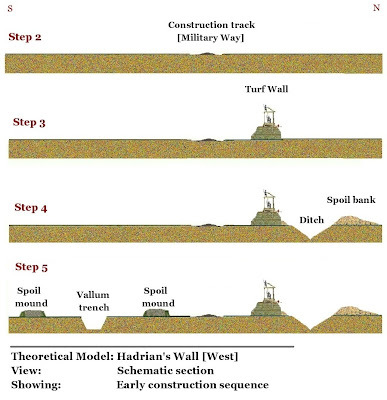 It seems clear that Hadrian’s Wall was a military frontier, conceived in response to a genuine threat, and built by the Roman army with nobody's interests in mind but their own. Cavalry was probably the more immediate threat, certainly to an army planning to spread out along an 80-mile front. Whatever the differences in culture, neither side was politically or militarily naïve, and in an age of hostage-giving and punitive sanctions, which could include genocide, any extant territories near the Roman forces were probably fairly cooperative. This was the first layer of defence, a buffer state, stiffened by outlying forts with good communications to warn of any hostile forces. This gives the option of a pre-emptive strike, before the enemy can concentrate or deploy their forces. When properly deployed, the Roman army could outfight most enemies, and as a result, it could employ aggressive military tactics, as exemplified by the design of their forts. 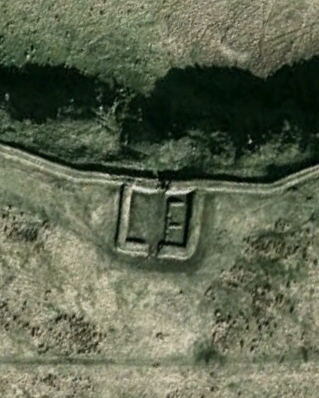 Unlike a native hill fort or medieval castle, the Roman fort has four, or more, entrances. 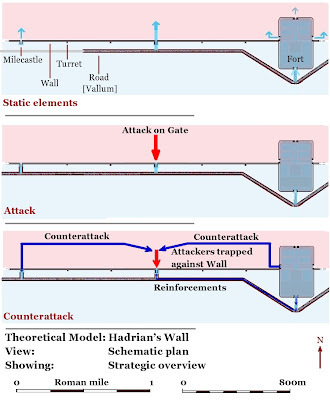 This allows that an attack on one gate can be counter-attacked and outflanked by the defenders using the other gates. In cavalry forts it is particularly important for the forces to have more than one option to deploy, and to not become trapped inside. Wall forts like Chesters and Birdoswald were designed so three of their four gates opened to the north of the Wall. The overall structure of the Wall seems to reflect a similar strategy, with a surprising number of milecastles and gates, some, like MC39, [right] opening onto almost sheer drops. This makes gates the obvious place to attack, break through, and deploy behind the defenders. 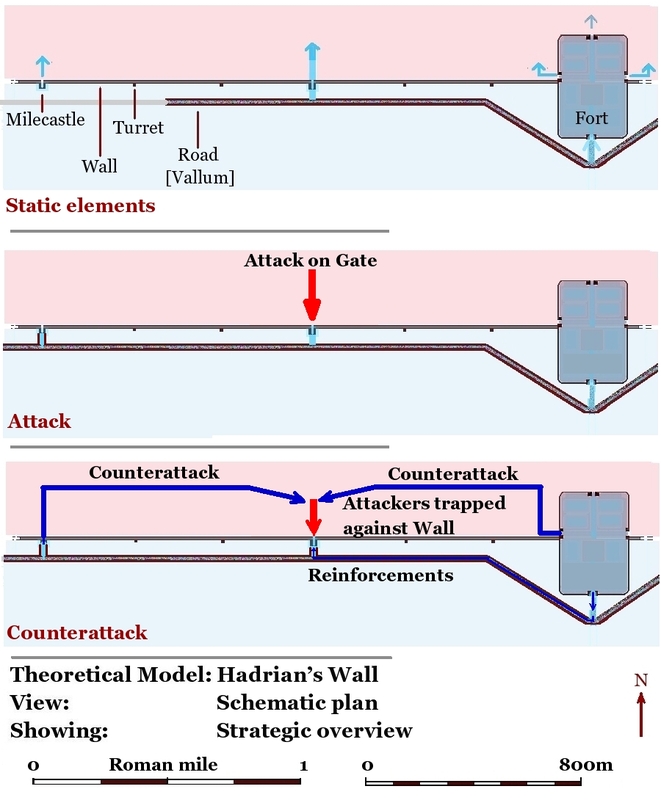 However, if the attacker fails to breach the defences, they risk being outflanked by a counter attack and trapped against the Wall. 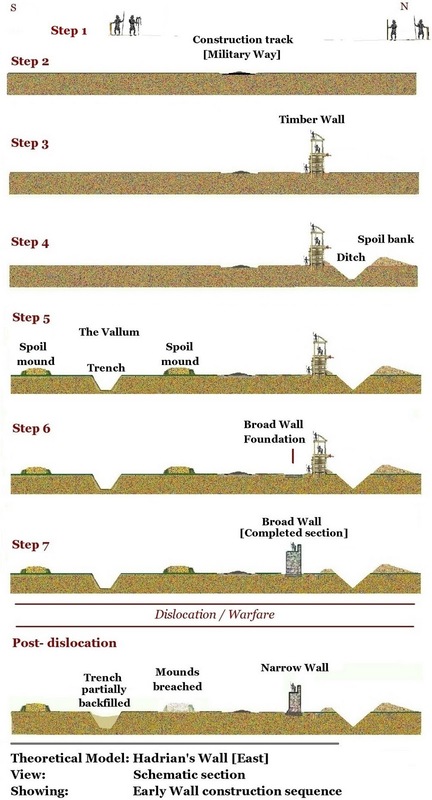 After over a century of scholarship, excavations, and surveys, there still remained one central, but subtle, conundrum: if you needed a continuous fortified frontier, and given it would only be effective once it was finished, how come it took about 10 years to complete? Since there is now little doubt that this was a war zone, breaking your army into small work details and spreading them along a 120km front could be regarded as tactically unwise, if not reckless. Undertaking such a massive construction project might imply that the frontier was peaceful and secure, which tends to undermine the perceived motivation behind building the Wall. 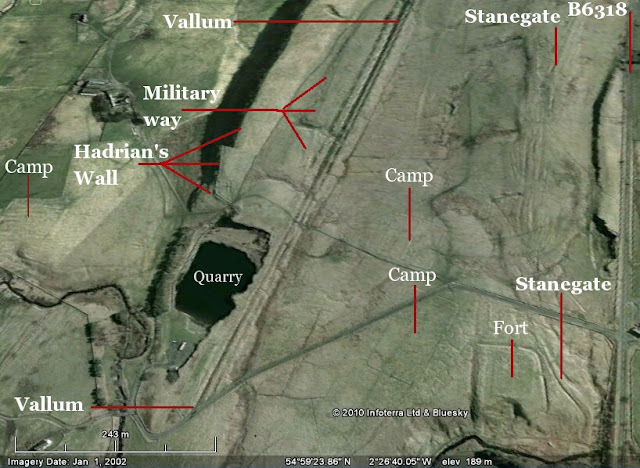 Similarly, the various explanations put forward to explain the Vallum have also required a degree of special pleading; to say it is a boundary is to overlook the fact that this is not how Romans, or anyone else, ever built boundaries. It is, however, how they built roads, and this seems to be the only explanation that fits the observable facts of the archaeology. This makes sense as part of the initial plan for the frontier. It makes sense, as does the abandonment of the project as the Wall was scaled back following a ‘dislocation’. This is a key to understanding; the dislocation[s] mark a distinct break in the Wall’s construction, and it is now thought that this was disrupted by serious warfare, perhaps on more than one occasion. When work resumes, the plans for the wall are scaled back. The ‘Broad’ Wall under construction is superseded by a ‘Narrow’ Wall, and there is a marked lowering of standards in the quality of the stonework. As primarily an army of heavy infantry, the Romans used earth and timber ramparts to protect themselves, particularly from cavalry. Fixed installations ensure the enemy dismounts and fights on terms and ground chosen to suit the defenders. The initial and temporary rampart represented by the Timber and Turf Walls provides a rational and secure basis for the much more complex and specialised task of building the Stone Wall. We can assume on the basis of the Turf Wall that it had some form of turrets and milecastles, and that therefore it was fully garrisoned and in every way fit for its purpose. While the context of Caesar’s siege of Alésia was quite different, he claims that the first 18km of defences were built in 3 weeks. Thus, it might take about 20 weeks using Caesar's army to build a 117 km long rampart -- but of course it’s not that simple. However, the Roman army was good at this sort of thing, it’s what they did for a living, and creating a 117 km corridor was probably achievable within a year, especially since, with static defensive structures, it’s all or nothing. You can’t have gaps. The rapid building of a fully functional frontier, probably within a year, was a strategic fait accompli that would have materially affected the military and political situation in the North of Britain. The arrangements and treaties that had ended the prior conflict, and prompted the building of a permanent frontier, may have been undermined by this unprecedented, and probably unexpected, move. We cannot know if the appearance of this initial rampart was a causal factor in the warfare represented in the dislocation[s] in the construction, but its outbreak indicates that this cautionary approach was justified. Similarly, the building of additional forts along the Wall, when work resumed, also suggests that it had proved ineffective, emphasising the very real threat posed by incursion from the north. While the scaling down of the size of the Wall could be regarded as an attempt to finish it quickly, the decline in the quality of the masonry may also indicate serious casualties among the skilled legionary workforce. Cip´pus n. 1. A small, low pillar,square or round, commonly having an inscription, used by the ancients for various purposes, as for indicating the distances of places, for a landmark, for sepulchral inscriptions, etc. Webster's Revised Unabridged Dictionary, published 1913 by C. & G. Merriam Co.
 After Fig 15 p73 Bidwell, P T, 2005 'The system of obstacles on Hadrian's Wall; their extent, date and purpose', Arbeia J, 8, 53-76. Changes it from a grand and imposing "monument" to a dynamic engineering process attempting to solve some very sharp and pressing real-world problems, and being inconveniently impacted by contemporary "events, dear boy, events". In much the same way you've done for big ol' timber round thingies. Although Mr Nitpicky here thinks you might want to flip the N and S on the cross-sectional figures, else it'll look like a early bid for Scottish Independence .. ? Thanks Heather, very kind you. Engineering is like any 'craft', it has a perfectly rational basis, and solving problems is a defining human characteristic. I always worry when archaeology looks to the irrational for an explanation. Thanks Dustbubble - well spotted - I seriously messed up with those drawings, which I have used before! I have corrected it, thanks again for your help. Being inconveniently impacted by contemporary "events, dear boy, events". great represented by the Timber and Turf Walls provides a rational and secure basis for the much more complex and specialised task of building the Stone Wall. Thanks Jimmy, You hit the nail on the head, a jobs only as good as the prep work!